Like Frankenstein's monster, the G7 (minus China) spent nearly a trillion dollars and the US dropped interest rates below inflation in order to reinflate the G7 stock markets and to reinstate the Status Quo. Horray. As I pointed out yesterday, the guys dumping epic amounts of debt via the carry trade upon everyone are estatic and hope to continue this madcap process for the foreseeable future. This means our empire is doomed. The United States MUST change the status quo! This present system means we must import more and more and take on more and more debts we can't afford. By lowering the discount rate and issuing a statement conceding threats to the economy, Federal Open Market Committee members effectively ripped up the economic-outlook statement from their Aug. 7 meeting. Some economists describe the about- face, coming after months of assurances that the subprime- mortgage rout was contained, as Chairman Ben S. Bernanke's first serious error since taking office last year. This is the nature of humans and it is key to why all empires go bankrupt: once a status quo is set, the vast majority want it to stay. It doesn't matter what it is, everyone gets used to things being a certain way and only some outside force will bring change. Horrible systems can run for many centuries if there is no outside force making it change direction. For example, the peasants of Europe accepted their fates and did little to change and every revolt was put down with great violence by the ruling class. Then the New World was discovered. Unlike previous trade discoveries, the size of ships grew rapidly since this was strictly sea trade unlike the Silk Road trade which was tedious crossing of land masses. Since all trade with the New World which was strictly one way for the first century...ie, looting...the ships had to become bigger and bigger fast. As the ships grew in size, the opportunity for peasants to flee the status quo grew and one of the biggest export items to the New World was immigrants fleeing the status quo of Europe and this, in turn, created change which led to revolutions. The world has been undergoing a revolutionary change in trade and capitalist development this last 100 years. 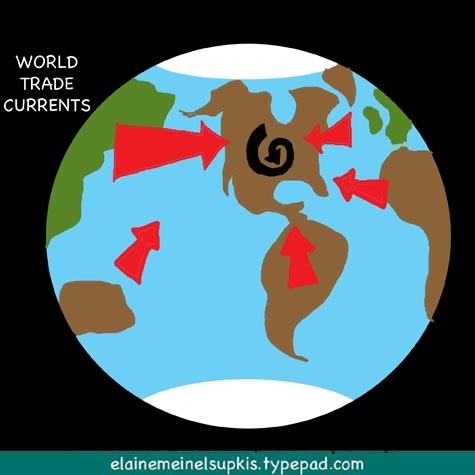 Just as the triumph of Mohammed cut Europe off from the Silk Road in the Dark Ages, just as the Mongols depopulated the vast steppes of Russia and crushed the Chinese peasants, these were huge changes in world trade. Mostly cutting Europe off from the great work houses of China. When Europe changed to sea trade, their ultimate goal wasn't just gold, it was gold so they could trade with the Chinese empire again. All sunken ships have been found with the captain's quarters filled with what the Chinese considered to be crude porcelain wares, the silk being long destroyed by the sea. The gold from the New World flowed to China. This irritated the Europeans who used their ships and guns to regain the gold China had amassed. And they stole artworks and other valuables. This was a series of pure looting. After that, European empires ripped China and the Ottoman empire to shreds, looting and destroying in an act of great historical vandalism. Neither the people of the Ottoman Empire or the Asian empires have forgotten this history. We are now in a cycle where the money is again, flowing to China and the Ottoman Empire. I read in the news today that the US wants to destroy Iran in the next six months in a wild attempt at destroying the remnants of the Ottoman Empire. This is backfiring because it raises the price of energy and we import most of our energy and our nation is going bankrupt. China is NOT going bankrupt and while we flail around in the Middle East trying to destroy anything resembling the Ottoman Empire, the Chinese Empire grows stronger and stronger by the hour. Instead of competing with China, we are making the Chinese capitalist empire stronger. Right now, our ships go to China with junk and the Chinese then add human labor to it and return it as gold. This dynamic is the same we saw for 3,000 years before Columbus. We should recognize that this pre-columbian economic dynamic is putting us back into the position of being the New World that is looted of all its natural resources in order to pay China for manufactured goods. So many Americans are involved in making China stronger, it is now nearly impossible to turn aside from this course. The Federal Reserve will, for the foreseeable future, run our economy for debtors and not savers. Savers have been ravaged for years now, during the 1% regime just 3 years ago, it became so pointless to save at all, we as a nation ceased saving at all and went a quarter trillion in the red. And our national debt has only grown and grown and doubled in size during the last 7 years. China and Japan are very nervous that we will change the flow of money to Asia but they will relax. China just showed the American rulers the dangers of rocking this boat and Japan is gleefully returning to demolishing our industrial base or transfering ownership of our industries to them. Europe is doomed and will slide into the Dark Ages again unless they figure out their alliance with the US means they are harnessed to the Asian/New World trade in such a way that they will pay for all this. The euro didn't strengthen Europe, it is now strangling Europe. Will the nations there drop it? Europe doesn't have the political power or the military might to do as they will with their currency. The US can threaten to stop trade, for example. Europe can't. The US can attack the Ottoman Empire. Europe can't. The US and Russia can argue loudly, Europe can't. In order to get the US to be Europe's imperial club for beating up on Russia and the Ottoman Empire, Europe has to let the US use the euro as a default currency which means Europe can't do much trade with the world because they cost too much while Japan gets the lion's share in the world and China gets the lion's share of trade...IN EUROPE ITSELF. See? The older system is back with a vengence. Europe had a ghost of a chance of changing this when the Federal Reserve recognized it had to raise interest rates and strengthen the dollar. But that is gone. Will Europe celebrate its death? Right now, energy is 'cheap' for Europe but THIS DOESN'T translate into trade advantage at all! China and Japan both can wring out all the energy inflation by exporting to...Europe. So Europe will be the place where inflation created by the reckless USA will be transmitted to Asia and then wrung out in Europe. So far, Germany has been able to have a high trade surplus despite this but their ability to keep this up is fading fast. The fact that Europe had to pay the highest price to keep this system going last week is proof they are being used to wring out American inflation that isn't cleaned out by cheap Asian labor. KKR Financial Holdings Inc. plans to raise $500 million by selling stock to institutional investors and rights to its common shareholders. They spring right back into action. The deals where everyone buys and sells each other, each cycle dumping vast quantities of debt upon these structures, will now pick up speed again. This has a very unhappy ending. We saw a glimpse of it a week ago. When it returns, it will be truly huge. The Greatest Depression as both the US and the European Empires go utterly broke in unison. All the nations of Europe that conquered the world were, at home, rather small. They didn't compete with China or the Ottoman empire much after 1800, they fought with increasing viciousness with each other leading to two epic, destructive wars that destroyed their ability to rule the world. KKR couldn't sell this junk to anyone last week but now they can because institutions and shareholders no longer can go off to the US government and buy CDs that are protected from inflation. Now they MUST go to KKR for protection from inflation. And this is 100% the reason why the Federal Reserve dropped interst rates! To shove us into the maw of these monster organizations that are private! HSBC Holdings Plc, Europe's biggest bank by market value, may buy 51 percent of Korea Exchange Bank from Lone Star Funds after two previous attempts to acquire banks in Asia's third-biggest economy failed. HSBC gets about 47 percent of its pretax profit from Asia and is emphasizing emerging markets to counter slower growth and rising consumer-loan defaults in the U.S. and U.K. Lone Star, a Dallas-based buyout firm, has struggled for more than two years to sell Korea Exchange because of a probe by local prosecutors into its 2003 acquisition. Half of their profits are from Asia? HAHAHA. See? The profits are in Asia because the inflation is in Europe. Europe, not Asia, has its currency rising in value while the Asians and the Americans reduce the value of their currencies! For a while, Europe will enjoy being the world's banking system. But then, they will be left with only that! And the accounts within this bank will be owned by the former Ottoman Empire and the Asian Empires! The US will be bankrupt. And this will pull apart the European banks. Right now, Asia holds the majority of the debts of the US. But what if they are now disharging this...to Europe? With the reinstatement of the status quo, I would suggest this is now the new dynamic. Because the status quo of last year is gone. This is a new system with subtle changes that we won't see or understand for two or three years. The role of a forecaster is to see what is possible and to explain it. And I am groping in the dark here but the outline can be seen as a shadow in the fog. And it bodes ill for Europe more than the US in this case. Bank of Japan Governor Toshihiko Fukui may say no to an interest-rate increase this week. It won't be his last word on the subject. Even before the market turmoil of last week, capped off by the U.S. Federal Reserve's surprise Aug. 17 move to lower the interest rate it charges banks, investors were betting BOJ policy makers would forgo an increase at their Aug. 22-23 meeting. Still, the 71-year-old Fukui, now in the final months of his term, remains determined to secure his legacy of ``normalizing'' monetary policy by raising the lowest borrowing costs in the industrialized world. ``If Fukui can't raise rates from 0.5 percent by March, he would probably feel that he didn't do what he set out to do,'' says Masaaki Kanno, a former central-bank official who is now chief economist at JPMorgan Securities Japan Co. This particular aspect of the status quo is key to the ongoing collapse of the global banking system. The US is imitating Japan more and more as we struggle to deal with our own economic collapse. The easiest thing on earth to do is to drop interest rates to lower and lower levels. Japan has managed this by doing two things: making the workers much poorer and by restricting trade as much as they dare which is quite a bit at this point. The US and Europe are both now so addicted to the Japanese carry trade opium, we can't break our addictions. We want them to keep this going and to do this, note how both Europe and the US have utterly ceased pressuring Japan to strengthen the yen or open trade with the world. I saw a headline in the Japanese news 'Hedge funds flee Japan due to difficulties.' Hahaha. Even hell hounds can't do it. Japanese stocks advanced by the most in more than five years after the Federal Reserve unexpectedly cut the discount rate to ease credit, boosting stocks in the U.S. and Europe. Canon Inc. and Mitsubishi Corp. soared on reduced concern the U.S. economy, the world's largest, will slow. Mitsubishi UFJ Financial Group Inc. led gains by financial stocks. So what if millions of Americans go bankrupt? The system is going to grind onwards! Over their crushed bodies moves this giant Mega-mecha from Asia. Japan's stock market crashed and now it is soaring to the heavens! And this is bad news for us. For 100% of what their stocks represent is debt to the US and a continuation of them wrecking our own economy while making the top 1% of Japan richer and richer. At our expense. The yen weakened against the euro for a second day as a rebound in stock markets across Asia suggested investors will have more confidence to borrow the currency to buy higher-yielding assets. Indeed! Hello, can everyone see the obvious now? The stronger the world's economy, the weaker the yen! The more the Fed gooses the US stock market, the weaker the yen! Wow! And this means Japan's trade relationship with the US makes Japan richer and the US poorer! So why on earth are we doing this? Can't we see? Well, this takes me back to the children betraying America: the super-rich want this system. They get lots of money from Asia if they impose this system on us. We got lots of poisoned cheap toys that kill our kids or Japanese cars that destroy our own auto industry. Whoopee. Great. What a deal. And we get tons of debt. ``The yen will remain on the back foot,'' said Tony Morriss, a currency strategist at Australia & New Zealand Banking Group Ltd. in Sydney. ``The rebound in U.S. stock markets, in the sense that the Fed is there to support growth, is pretty positive for carry trades.'' The yen may decline to 115 per dollar and 155 per euro today, Morriss said. Lowering interest rates here means the yen will now weaken again like crazy. China will not complain because the yuan will weaken too, if they desire this. The Chinese are thinking hard about the lessons of history and will make their next move soon. They don't want to destroy their banking system like the Japanese have done. Nor do they want to isolate their people and make them poor as Japan is doing. They want to be the center of world commerce. I bet they will do something responsible to strengthen their own systems. TOKYO (Kyodo)--Tokyo stocks rebounded sharply Monday morning after last Friday's plunge, lifting the Nikkei index nearly 600 points due to higher U.S. shares and a weaker yen. Just two weeks ago, Japan was boasting that they didn't manipulate their currency. It was Japanese housewives, unable to save money anymore, betting against the yen, not the Bank of Japan. Now they are openly killing the yen again. Note that 'overnight key rates' rising is a PROBLEM for Japan! The US complained about this last week. Real rates were higher than what either national bank regulators wanted. This is because the rates set by Japan and the US are FAKE. Instead of accepting this as the real rate, both nations are pumping money into the system to deliberately lower rates and this causes inflation which only China can clean up. Hedging is the act of offsetting the risk or potential risk inherent in economic activity through multiple means. There are many more ways to hedge than engaging in routine risk-covering. For example, a Japanese exporter operating in dollar-denominated contracts will try to avoid the risk of the dollar depreciating against the yen by reserving the right to sell U.S. dollar futures. This is an act of covering. The move fully eliminates price risk, although the exporter's trading partner remains exposed. However, an exporter to China working with yuan-denominated contracts won't be able to do the same thing because Chinese monetary authorities do not allow liberalized yuan futures markets. Therefore, the exporter will try to deal indirectly with yuan exchange rate fluctuations by selling currencies forecast to move in the same direction as the yuan — like the Hong Kong dollar. This type of indirect risk management technique is called a hedge. People concerned about a decline in buying power often hedge against inflation by investing in gold. This Japanese story is actually full of information. And do note that China is one big hedging operation. They have been using Hong Kong for years as a shield and a cover for their deeper activities. Given what is happening today, it appears the term "hedge fund" is a misleading one. If these funds can't guarantee that their risks are being properly hedged, they should use a different name that better reflects the nature of what they are. Yup! I am so happy someone else sees what I have said in the past: our hedge funds no longer hedge anything, they are simply investment trusts like the ones outlawed after the Great Depression. So why not change the name back to the original? The monetary policies of the Bank of Japan and the U.S. Federal Reserve are at a difficult juncture now because an interest rate cut by the Fed or a rate hike by the BOJ might increase volatility in the currency markets even further. But it must be noted again that the sharp rise in the number of hedge funds is a sign of excessive liquidity worldwide, and the huge growth in yen-carry trades has come to symbolize this. Japan has been a major source of this excess liquidity, and the BOJ needs to pursue its monetary policies based on that recognition. Teruhiko Mano is a professor at Seigakuin University Graduate School. An economics professor I can like! In Japan, of all places. The yen-carry trade has dangers for Japan. One obvious danger is social unrest as the people cease bowing to the rulers and become rowdy again. The power of the elderly is a counterweight here but the government is actively trying to cut funds to the elderly and there is growing discontent as we saw in this last election. Resetting the system to continue this carry trade business means wrecking both Japan's, the USA's and Europe's banking systems. We just saw a preview of what this will do, last week. Namely, stopping it will be nearly impossible. If the US drops interest rates to 1% again as inflation rages, this will destroy everything, all the world's banks. All that money will burn up via inflation, the silent fire. When the world's banking systems collapse, so will world trade. This happens every time a world-girdling empire goes bankrupt! Rising home prices and innovations in the financial sector are the two biggest factors in the spike in U.S. household debt and the related decline in savings, Federal Reserve Vice Chairman Donald Kohn wrote in a research paper presented Sunday. In a paper presented to a conference held by the Reserve Bank of Australia, Kohn and a Fed economist wrote that a "wealth effect" caused by rising home prices could boost consumption, leading in turn to an increase in household debt. Expenditures for more expensive homes are another factor behind an increase in debt, wrote Kohn and co-author Karen Dynan, chief of the household and real estate finance section of the Fed's Division of Research and Statistics. In their paper, Kohn and Dynan noted that the personal savings rate in the U.S. has fallen from an average of 9.1% in the 1980s to an average of 1.7% so far this decade. In the same period, the ratio of total household debt to aggregate personal income has risen from 0.6 to 1.0. There it is in stark numbers: our debts are now 100% instead of 60% of our collective wealth. Amazing. And savings during the high-inflation but also high interest rate years was nearly 10X greater than today! And the 1.7% of this decade is a false number. It hasn't been over 0% in two years. It is -1.7%! OUCH. This is why comparing decades leads to delusions. We must grip this by the horns: Americans are not saving ANYTHING AT ALL. Collectively, we have entered the zone of bankruptcy already. This is where one can't take on more debt. We are at this point but the Asian banks will continue to extend loans even as we walk into this trap. "Innovation has opened up greater opportunities for households to enter the housing market and for homeowners to liquefy their housing wealth, thereby helping them smooth consumption of all goods and services," they wrote. ARRRGH. 'Liquefy' means turning wealth into DEBT!!!! The innovations in debt instrument creation is wrong! It is bad, not good! Bad! And there should be laws forbidding this. And what are we consuming? Imported oil, imported goods. And this has caused our trade deficit to grow hugely and it is destroying our industrial base and all this debt is making things worse and worse and worse and now we are set to make savings even lower and debts even higher. Whoopee. They will try to revive it, alas. Beating a dead horse that can no longer pull our economic wagon. Oh, thank you a million, John! I will feature that in the next posting. It is a treasure. Laughed my head off.